This is completely non-tech, so feel free to skip ahead if you're not interested in personal stuff, particularly Corgis. 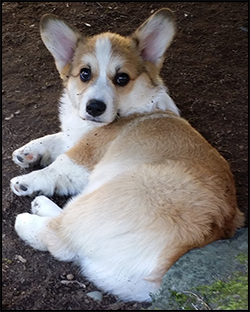 There's no video this week, and just a couple of articles, because this last Saturday my wife and I hosted the 2016 Pacific Northwest Corgi Picnic. The short version (no pun intended) is that around 100 people and 100 Corgis run around our fenced back yard for the afternoon. We've been doing this now for something like 17 years - that's longer than Ask Leo! (more on that next week). It's a fair amount of work, as you might imagine - preparation, the event itself, and the clean up afterwards. But it's always a blast and we enjoy ourselves immensely. Not to mention that we use it as an opportunity raise funds for a Corgi-related charity as well. The picnic page has links to a ton of pictures, including some from a local news station. So,I just wanted to share the fun, explain why this week's newsletter might seem a little light, and also to thank you for allowing me to serve you in a way that let's me do fun stuff like this. What you need is called a "signature". Sometimes, their signature even includes their name. Continue Reading: How Do I Get my Name, Title and Other Information to Show at the Bottom of Every Message I Send? So I did this search on your answers to power supplies but I'm still not clear about the difference between amps, volts and watts. I've got a 130 watt power supply, left over from my last Dell laptop, that I would like to use on my new Ultra book which came with a 65 watt power supply. Both units are 19.5 volts, but the 130-watt is 6.7 amps and the 65-watt has a rating of 4.6 amps. What I'm trying to accomplish is keeping the 65-watt unit wrapped up in my laptop bag and the 130-watt wired into my desk for convenience. The short answer is that you may be able to use that 130-watt power supply with your new machine, which came with a 65-watt supply, if a couple of conditions are met. Scareware is a form of malware designed to scare you into taking some action that further damages or infects your computer or costs you money. Most common forms of scareware display a list of infections supposedly on your computer, and inform you that you need to purchase the "full version" to remove them. In fact, the infections are completely fake and are listed only to intimidate you into handing over money. Whether or not the software you purchase actually does anything at all is debatable, but it's not uncommon for this program to contain even more malware. "Your backup USB or Mobile hard drives must be physically detached from your computer once the backup is completed." - I think it makes better sense to keep external drives connected in order to keep the backup process automated (there's probably a greater risk of somebody forgetting/neglecting to reconnect the drive and then being without backups than there is of them being hit by a crypto - especially if they exercise commonsense). That said, it certainly makes sense to have an additional cloud-based backup mechanism in place as 1) it gets your data offsite and 2) services that enable versioned backups (most do) make it easy to recover from a crypto. mhhh... my former comment against win10 got somehow erased.. so.. Leo.. is this forum meant only to publish favourable opinions for win10? because i don't think everyboydy likes it and here it seems everybody is happy with it.. Your previous comment seems to be there. Sometimes in WordPress, there's a delay displaying comments on the page. We welcome all comments on Windows 10, both positive or negative. Leo has often expressed his frustrations with how Microsoft has been (mis)behaving. We only remove comments that are abusive, profane or off topic. There are certainly plenty of negative WIndows 10 comments on the site so that's obviously not one of our criteria. That's why I always set my antivirus to NOT add that kind of "certification" on outgoing messages. I let it add the message on incoming messages. I'm further reducing the publication frequency. I'll cover why any site might want to, and include a few behind-the-scenes facts and figures about where we are.